This tutorial discusses the application data folder and what to do in the event Stator can’t locate it. Where it is located by default and what it contains. What is the application data folder? The application data folder is a folder containing files that can change during the normal course of Stator activity. The default install location is in “Program Files” which is read-only by default. As a result of this limitation any files which can be changed, saved, modified during the course of normal usage are stored in the application data folder. This includes the data layer file. Where is the application data folder located? 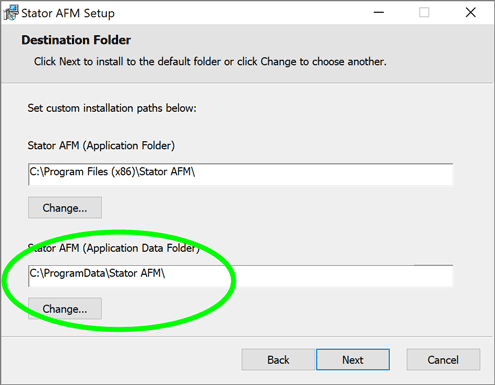 By default the application data folder is located at C:\ProgramData\Stator AFM. During the installation process you can override the default location for the application data by clicking on the “advanced” button and pointing the installer to a new path. What happens when Stator can’t find the application data folder? As soon as you launch Stator it checks for the location of the application data folder. 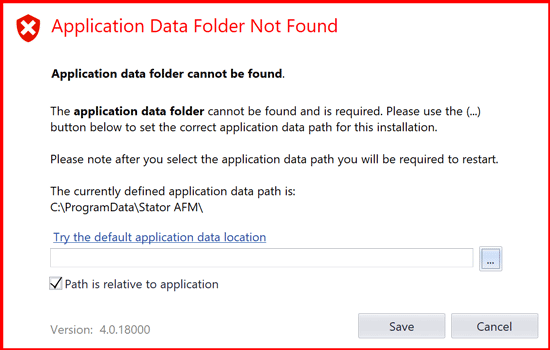 In order for Stator to work it needs to find the application data folder, if Stator can’t determine the location of the application data folder the following screen is displayed which allows you to manually locate the application data folder and then continue with start-up. If you see the above screen during start-up you need to manually locate the application data folder. Click on the “…” button to open a folder selection dialog. Navigate to the application data folder. The selected path to the application data folder will be displayed in the respective field. Click the “Save” button to save the location. Please note the “ProgramData” folder is hidden by default. To display hidden folders you will need to enable the display of hidden folders from within the operating system, windows explorer. After you click on the “Save” button Stator will continue to restart. If Stator continues to encounter any issues in regards to the application data folder, additional screens will be displayed. If the application data folder has been successfully selected start-up will continue as normal.